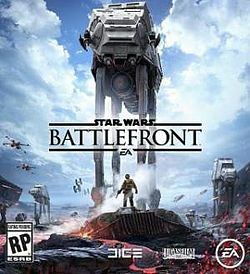 Star Wars Battlefront 3 was released by EA Games in November 2015 for the Xbox One, PlayStation 4, and PC. Battlefront takes place during the Rebellion era depicted in the Star Wars original trilogy. You play as a soldier for either the Empire or the Rebellion with a goal beating the apposing side. There is no doubt that Battlefront looks beautiful. Never before have the worlds of Star Wars looked this good except in the movies. Battlefront 3 also is a big improvement over the look of the first two games which isn't saying much since they came out two console generations ago. Seriously why did Lucas never release a new Battlefront within the last 10 years? It's nuts! In Battlefield you play as a soldier for one of the factions during the Rebellion. Battlefield uses the Frostbite Battlefield engine so if you're familiar with Battlefield you'll have no trouble with Battlefront. You can play with a first person perspective or third person depending on your preference. This game is similar to Battlefield where you have a limited amount of guns available to you that have to be unlocked to be used. That is the way modern shooters work so people who played the older games may have a shock when they can't use their favorite guns out of the gate when playing online. For those that like to play offline there isn't much for you in this game. I wanted to be surprised when the game came out so I didn't read anything about the game while it was in production. You can image my surprise when I sat down with my brother to play online together and found out you couldn't. The only way to play together online is with two games and two consoles. What is available for people to play in the same room is pretty limited and honestly it kind of wrecked the game for us. We use to have lots of fun getting together and playing the old Battlefronts against each other but now we can't and it's a shame without lugging a bunch of console and TVs to someones house. It is even worse for the single player campaign which doesn't exist. Everyone knows that the Call Of Duty games are online multi player games first and the campaign are an afterthought but I liked playing them and a single player game in the Star Wars universe would be great. Instead we get a few training missions and a handful of other games to play. It was pretty disappointing. Online modes contain the familiar games like team death match but Battlefront also has some unique modes. Cargo is basically capture the flag with the difference being instead of one piece of cargo being fought over there is multiple and the winning team is the team with the most cargo. Another mode is called Droid Run where you are a member of a six soldier squad and you have to capture GONK droids before the enemy squad can. The mode I was looking forward to the most was Hero Hunt. One player on the team is a hero like Darth Vader or Boba Fett and the rest of your team are soldiers. The enemy wants to kill your hero and if they succeed the player that killed your hero becomes a hero for their side and you now need to kill him. None of these modes are ground breaking but they are different enough, or at least had enough of a Star Wars feel to be fun. Another thing I found about this new game that was puzzling was in Battlefront 2 there were modes where you could fly small ships from your sides capitol ship to the enemies, board an enemy ship and take it over. In this new game you either play missions on the ground or in space but not bother. It took 10 years for this game to come out and it has less then it did then? I don't know the reason for this but that was probably my favorite game mode to play. Would I recommend this game to you? If you like playing online and that is your main focus then I would say yes. Battlefront is a great game that plays well and I had a lot of fun playing it. If you either don't care to play online or would rather play with people in the same room as you I would say no. There isn't much to play offline so be warned before you buy this game. I give Star Wars Battlefront 3 a 6 out of 10.